It is said the eyes are windows to the soul. But the windows to Kaysha Lee’s soul are her powerful voice, introspective lyrics and harmonious melodies. From learning to play piano at age six, to hearing her dad sing tunes from their native Jamaica, music has always been in Kaysha’s life. It might have been destined then that, at 15, Kaysha began to nurture her singing talent through participation in gospel choirs. Eventually, she toured Canada, the U.S. and France with the Nathaniel Dett Chorale, received a Gemini award as part of the Sharon Riley and Faith Chorale and performed at Barack Obama’s inauguration. At that time, Kaysha was also a music teacher. She credits these experiences with helping her to embark, in summer 2009, on a solo career. The journey hasn’t always been easy. Aside from vocal precautions, Kaysha faces a different battle. In 2003, following two car accidents that resulted in neck and lower back disc injuries, & widespread chronic pain. The outcome saw Kaysha on medications until she decided on a natural route, which now includes the healing methods of Jamaica and a vegan lifestyle. Passion for music also allows Kaysha to persevere. Since going solo, Kaysha released the singles Pirates in the Ship, (featuring rapper QuandoN) and My Hearts Crying For You, which is available through iTunes and most digital outlets. She followed up with her demo mixtape, Undefined, which was released in London, England and Toronto last year. Two copies are available, one with DJ Kenny and Lindo P mix & sound effects also one without. With a fusion of mid to up-tempo reggae and soul-influenced R&B, Kaysha’s song topics range from the ups and downs of life, reality to love. She will also incorporate her classical piano training and eventually guitar, into new material. Kaysha also recognizes the importance of stage presence. As a mesmerizing live entertainer, she’s performed at Toronto outlets such as Afrofest, Trane Studio jazz lounge and Follow Your Instinct’s talent showcase as well as New York City’s most well known open mic nights at the Village Underground. In September 2010, Kaysha staged a successful showcase in England. During the trip, she also conducted media interviews and collaborated with British artists. However, it was a late-2010 move to Jamaica that saw Kaysha throw herself vigorously into the music scene and recording process. Having settled in Kingston, she has since released two tracks (Take Me From Disgrace and 3 Weeks) that were in rotation on Carribean radio stations such as Irie Fm. In addition, Kaysha has re-released Just to Be With You and Heart of a NinJah, both from Undefined and has released a video for Just To Be With You. Just To Be With You video can now be viewed on various tv stations in Jamaica the Carribean and online music mixes worldwide. It seems this young musicians heart for music cannot be contained because she has recently pre-released a reggae remix to outkast’s “Prototype” Produced by Dia of Builders Music for Life Felt Music Group. Kaysha had special guest artist join her for an intimate 2 sets at Suzie’s Bakery in Kingston. 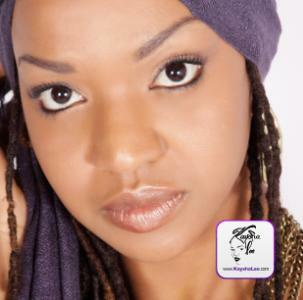 She has also since opened for controversial poet Mutabaruka in Portland and celebrated Emperor Haile Selassie I’s visit to Ja by singing at Tuff Gong Studios Friday April 29th 2011. Speaking to Kaysha Lee about her journey and her artistry you will feel the passion she holds for her mission, her music. The move to JA in December of 2010 had Kaysha’s brain on healing and music. Kaysha says she felt at the time she needed to leave her Jamaican family in toronto Canada and join her jamaican family in Jamaica so that she could continue to and better heal from the injuries of a couple car accidents a few years back. Also being heavily into reggae she felt the move would benefit her career strides as well. They say there is one from every family to be called to rasta and it would seems that Kaysha was that one from her family. Not wanting to strain her family with rasta beliefs they could not understand at the time and a music lifestyle they could not understand either, Kaysha decided it was best to live on her own. A Canadian woman living in Jamaica on her own presented quite a few hurdles. Kaysha, arrived in Jamaica with great positive dreams and at a point fell on some great negative times. From being in a fight with a member of a short lived team and having a knife pulled on her in portmore, the life was not what she had expected at first. Nevertheless, her trod continued. She soaked up the negativity and spewed it out positivily continuing to pursue her first love, music. Immediately after the rough patch, Kaysha physically dropped off her video for “Just to Be With You” to the various tv stations in Kingston eventually receiving a favourable response from Hype tv and RE tv and few other stations. Kaysha says “I give tnx for the many ductors and bus drivers who directed me to the various places i needed to go. Also much love to Bird my regular taxi man who i saw less of as the money depleted but who also gave me a bligh once in a while.” It would seem that as much as Kaysha had been thru a rough time her faith in the almighty was strong. Angels were in her path to help her elevate and continue on. It was one evening while she was staying in Sherlock she received a phone call saying “Kaysha your video deh pon tv!” The young artist, living on her own had no tv at the time but says she felt a great sense of gratefulness to Jah because after such a fight, and the disappointment of the radio not playing her previous single entitled ” 3 weeks” anymore, it was the push of motivation or the sign she needed to keep on. One day Kaysha received a message on her facebook saying ” call I” from Rory Stone Love. He brought Kaysha Lee into his studio and tested her. He wanted to know what she could do. After a mock recording and some testing questions, Rory told Kaysha he would like to work with her. He had some great ideas that he wanted to execute with the young artiste. Kaysha was happy with this ending note and returned to Toronto, Canada with intentions of returning to her 2nd home Jamaica for the winter. When Kaysha Lee returns to Jamaica she will be working with Rory Stone Love on 5 songs. Kaysha says “we are not in a rush for those 5 songs. We are looking for the best.” It’s being said a lot and that is because it is the truth in life. It’s not a competition its a mission. Kaysha humbly agrees her mission started out a bit rushed by the perception of most. She also says she has no regrets. Kaysha states that “At this time I am becoming more mature in the industry, still young but i feel the maturity dancing and this time around, this next segment in my journey will be a little less wild and more militant. I believe music is a wild focused militancy. Big Up all heartical royalty trodding the music journey. It nuh easy, Jah know but so rewarding and i know to the stage im at i have not even seen the greatness possible as yet. I am still young and building. I give tnx for all the helpers and teachers on the way. Jamaica see you soon, love you miss you. Kaysha continues to get involved in local events on her short stay in Toronto and continues to spread her eclectic, undefined sounds across the nation to all who will take the time to discover this blossoming ariste. With an infectious sound, stunning looks and a charming personality, Kaysha Lee is letting the world see her soul, one lyric at a time.